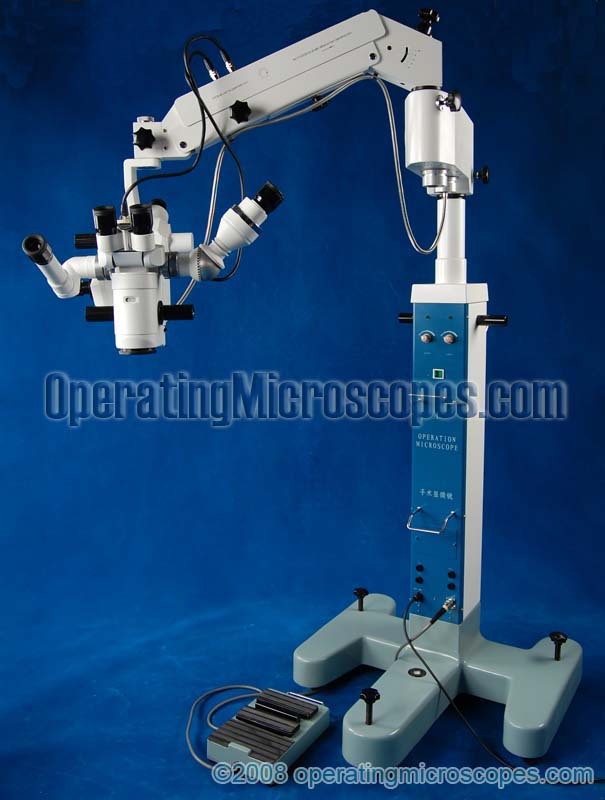 There are various types of surgical operating microscopes that are used for different applications. 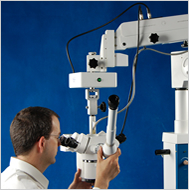 One common type of operation microscope is used by ENT (ear, nose, and throat) medical doctors. The binocular head of the microscope is straight without any angle. Also, the focal length is usually different. The focal length of a surgery microscope is changed by simply screwing on a different bottom lens under the head. This also will change the overall magnification. Another common type of microscope for surgery applications is used by ophthalmologists for correcting problems with the human eye. The binocular head of this microscope is on a 45 degree angle and the focal length is usually different from equipment for ENT usage. There are also microscopes for general operation such as hand microsurgery, orthopedic surgery, brain and neuro microsurgery, dental, and other microsurgical applications relating to human medical needs. 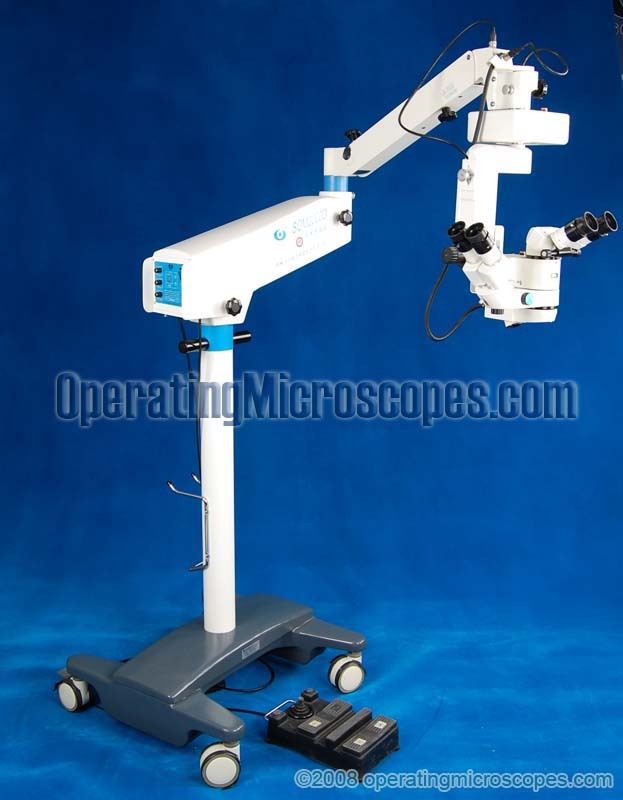 Most microscopes for surgery have motorized foot controls for at least the focusing of the image to free up the surgeon’s hands for holding the medical tools. The higher grade equipment has additional foot controls for movement of the head. Some motorized controls are located on the head assembly itself, and control rotation of the head in multiple degrees of rotation as well as centering the optics on the area of interest. A common optional accessory on an operating microscope is the inclusion of multiple heads for simultaneous viewing. Medical surgeons often use assistant doctors and nurses during the operation procedure. These assistant heads are also good for medical students for educational purposes. For student use in a medical school, the extra viewing head would be termed a teaching or training head. If used during surgery by a medical professional assisting the lead surgeon, the extra head would be termed an assistant head. These assistant heads (teaching heads) can be monocular with only a single eyepiece, or binocular with two eyepieces. They may see the exact magnification as the lead surgeon’s binoculars, or they may have independent magnification controls. Higher grade medical surgical microscopy equipment will often have multiple assistant heads allowing simultaneous viewing for as many as three medical staff members in the operating room. Another optional accessory on a surgical operating microscope is the use of video display. A system can be fitted with a beam splitter and c-mount for connection to a ccd color video camera. This type of microscope camera will output a composite video signal to a cctv video monitor for all medical personnel in the operating room to see. The video of the surgery can also be recorded on standard video recording devices. A significant factor to consider when purchasing a surgical operation microscope is the quality of the equipment and certifications held by the manufacturer. As this equipment is to be used in a medical / clinical setting, many countries require certification or registration of the equipment or manufacturing facility. In the USA , the US Food and Drug Administration (US FDA) registers manufacturing facilities that make medical products. If the equipment you need is for a USA location, then you need one of our surgical microscopes that is made in an FDA registered manufacturing facility. We carry medical-surgical equipment from both FDA and non-FDA registered manufacturers. For locations such as in Europe , the CE certification is required for medical devices. We also can provide CE certified surgical equipment. For some countries, no certification or FDA registration is required. We can provide lower cost surgical microscopes to these other countries not needing certification. 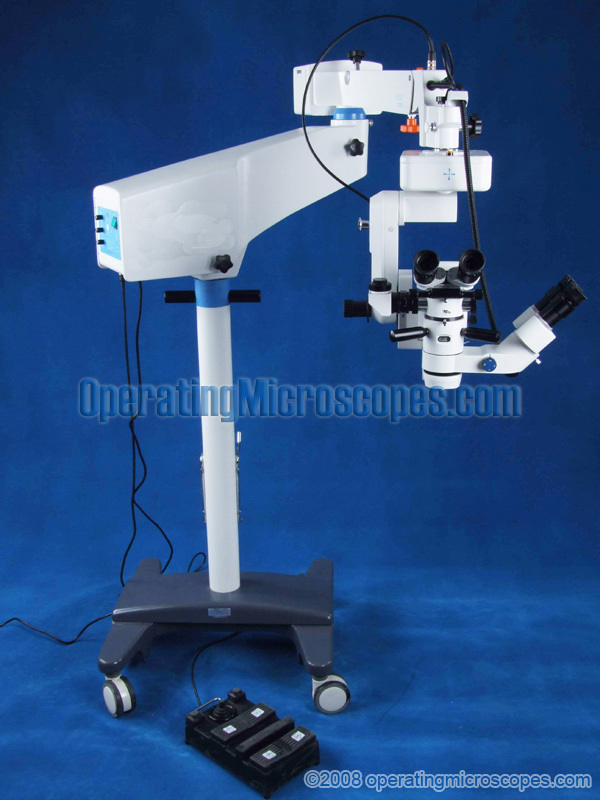 Our selection of surgical operating microscopes is wide, allowing the medical doctor to choose from many different types, with different optical features, different grades of quality, and with or without FDA manufacturer registration / CE certification. Our prices on these vary, but you can be assured our prices are competitive, and generally lower than anyone else selling identical surgical operating equipment. Please contact one of our sales agents today for more details on our microscopes for surgery.